Chances are, when your dog delivered her puppies, she was very thorough in her work, even cleaning up after herself in the process. It's normal for dogs to eat the placenta and afterbirth during the delivery process. If your dog took care of this bit of housekeeping, don't be surprised to see a bit of diarrhea for a couple of days after delivery. A close-up of a mother dog and her puppy. There was nothing wrong or bad with your dog eating her babies' placentas and afterbirth -- it was the natural thing for her to do. However, her belly may not feel so good as a result, causing a touch of diarrhea. And if she's eating puppy food, helpful for providing her and her pups the nutrition they all need while she's nursing, the new diet may be prompting a bit of loose stool. If her diarrhea doesn't clear up after a couple of days, you should contact the vet to make sure she's healthy. Keep your eyes open for other postpartum complications. There are a variety of conditions a new mother dog is vulnerable to, including eclampsia, mastitis, and postpartum metritis. 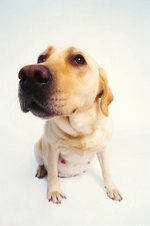 If your dog shows signs of a depressed appetite or fever and is nervous, hypersalivating and panting, or if she's not tending to her pups, contact your vet immediately, as eclampsia is a veterinary emergency.